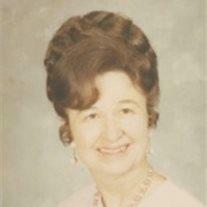 Charlcey Sudekum McBride, 95, passed away Feb. 19, 2014. Charlcey was born in Tempe, AZ on May 31, 1918, but was raised in Nashville, TN. She often told her children that she was delivered by the Governor of Arizona, who was a doctor. In 1938, she moved from Nashville to Arizona, where she met her husband, Jim McBride, at Gila Academy. In October 1939, they were married in the Mesa Temple. They had 4 children, Jim McBride Jr., Glenn McBride, Lynette McBride Hays, and Virginia McBride Fletcher (deceased). In 1952, Jim & Charlcey moved to Phoenix where they farmed for many years. Charlcey was very active in the LDS Church and did all kinds of church jobs, including: going on a mission, working in the Mesa Temple, leading the music, Seminary teacher, Singing Mother’s, Relief Society President and many others. In 1985, she was Mother of the Year for Tolleson, AZ. She enjoyed shopping and crafts. Charlcey has 17 grandchildren, 53 great-grandchildren and 2 great-great grandchildren. Funeral services will be held at Bunker’s Garden Chapel, 33 N. Centennial Way, Mesa, AZ on Feb. 24, 2014 at 9 AM, with a visitation to follow. Burial will be at the Pima Cemetery, Pima AZ on Feb. 24, 2014 at 4 PM. The family requests that in lieu of flowers a contribution be made to the LDS Missionary Fund.